Hello everyone, am just sharing another update from the Fantasy Flight Website, this time about the Game of Thrones Cardgame which is now in its second edition. I haven’t spoken much about this game, or at all actually, and I feel my comment is long overdue. Watch this space. Fantasy Flight have announced their 4th deluxe expansion to the game, this time for House Tyrell. Personally, I play as the Greyjoys as a matter of preference, however I have had a bit of fun with Tyrell decks too. All images on this post are from Fantasy Flight and you can follow the link beneath the excerpt to read the full article. His plate was intricately fashioned and enameled as a bouquet of a thousand different flowers, and his snow-white stallion was draped in a blanket of red and white roses. After each victory, Ser Loras would remove his helm and ride slowly round the fence, and finally pluck a single white rose from the blanket and toss it to some fair maiden in the crowd. The lands of the Reach are renowned as the most beautiful part of Westeros. Anything can grow in the rich, fertile soil, and the beauty of the earth is rivaled only by the nobility and chivalry of House Tyrell’s lords and ladies. As stewards to the Gardner Kings, the Tyrells served with distinction until the conquest of Westeros by Aegon Targaryen. When the last of the Gardeners were burnt to ash on the Field of Fire, the Tyrells were raised to lordship—and their fortunes have grown with their ambitions. 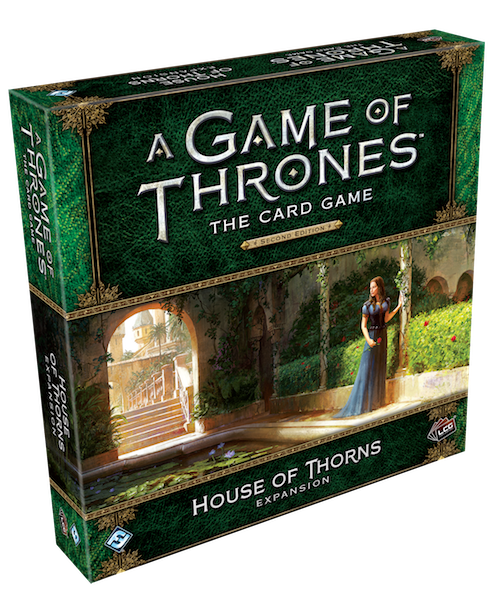 The House of Thorns deluxe expansion for A Game of Thrones: The Card Game brings House Tyrell forward into the sun with an influx of new cards, playing on their major themes. Perhaps more than any other House, the Tyrells embrace a dual nature—they are seen as the epitome of nobility and grace, while working behind the scenes to push their secret agendas. Today, we’ll look at the first side of House Tyrell, exploring how your Knights and Ladies can battle honorably to speed you to victory. Like I said, I tend to play as Greyjoys as I like their warship and Drowned Men theme, however the Knights and Ladies theme of House Tyrell seems to play quite well too, with lots of strong intrigue characters as well as potent martial characters, and a couple of abilities that allow them to limit their opponents – one on one. Just like any honourable knight would wish. Check out the full post on Fantasy Flight, and keep your eyes peeled for future posts about Game of Thrones. Yeah. I actually had the first edition of this game but could never get my head round the rules. Either they simplified them or I became better at understanding rules. It’s a fun game, and the Tyrell stuff I have from the core set and the chapter packs I own makes the Tyrells fun to play as their intrigue abilities are as much fun as the Lannister ones. Though, I still prefer the Greyjoy deck as it is basically a regenerator deck like a zombie deck in Magi the Gathering. Looking forward to that delux expansion.